The 36m/119ft CUSTOM SUPERYACHT was built by Benetti in 2009 with a refit in 2016. P B Behage and Benetti created her naval architecture, with the former also creating her interior design. 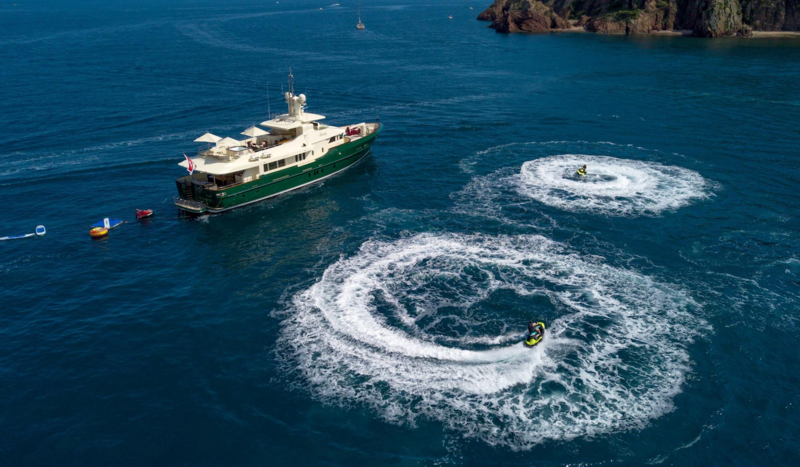 The accommodation sleeps up to nine charter guests in four contemporary cabins with a professional crew of six to offer a high level of service during the entire charter vacation. From the lower deck, guests can access the water using a ladder off the swim platform or ascend the stairs to the main deck aft, where guests can unwind on the stern-fitted sofa beneath the shade or dine alfresco at the large table with seats for up to six guests. The sundeck has an excellent variety of shaded and sun-exposed places for guests to lounge outside and to savour the surroundings: A Jacuzzi encompassed in sun pads is placed to the aft and two sun umbrellas can shade the area from the midday sun. Amidships there is a casual lounge, an alfresco dining table to seat all guests and a wet bar with a broad selection of refreshments. The day head/steam room is located amidships, with the forward section dedicated to the helm station. The lower deck contains the tender garage and the guest accommodation is placed forward of the engine room, providing a Master suite with a private lounge, a VIP stateroom and two twin cabins all with en-suite facilities. On the main deck near the foyer, there is a day head with a shower that doubles as a steam room for rest and relaxation after swimming hours playing with the water toys. The formal dining area is placed forward of the main salon and seats up to eight guests in timeless surroundings. The lounge places two sumptuous sofas and an armchair around a coffee table. Opposite, the TV opposite can be hidden in the cabinetry when not in use and a glamorous wet bar with a light-up front panel is placed into the aft starboard corner to easily serve guests inside and out. The sundeck also has a day head fitted with a shower and capable of being used as a steam room. A pair of CAT C18 Diesel engines producing 587 HP each produces a cruising speed of 10 knots, a maximum speed of 13.4 knots and a range of 5,000 nautical miles. 36M CUSTOM SUPERYACHT can accommodate a maximum of 9 guests in 4 cabins. The accommodation sleeps a maximum of 9 guests over four ambient cabins: 1 Master suite, 1 VIP stateroom and 2 twin cabins, one of which has a Pullman berth. The professional crew of 6 will ensure that all guests are well looked after throughout the holiday.